Lakeside Preschool: Lakeside's Preschool began in 1992 and serves up to 30 children ages 2-3-4 using traditional and Montessori methods. Hours are 8:30 a.m. -12:00 p.m. Monday through Friday. 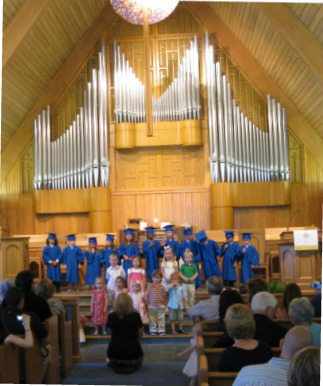 Our congregation provides space, utilities, and maintenance for this preschool program. Rachel; Holloman is our Director and Lead Teacher and instructs our four year old class. Cacky Daughtry teaches our three year olds, while Brenna Bennett teaches our two year olds. During the summer months, our Preschool offers two day camps for children 3-8 years old. To learn more about the camps, click on Garden Camp or Science Camp for information. To download a registration form, click here. As a part of our Preschool, Sharon Boistard coordinates a Mom's Morning Out (MMO) program, offering care for infants and toddlers Monday through Friday from 8:00 a.m. to 2:30 p.m. To make arrangements for MMO, call 451-0546 at least 24 hours in advance.